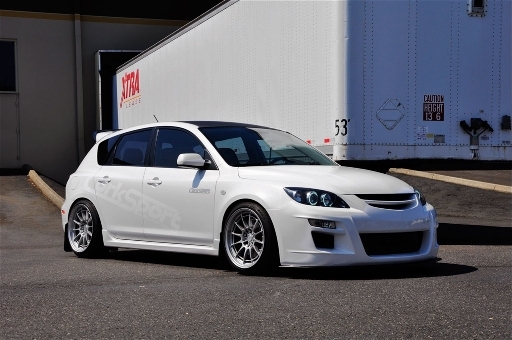 Seattle based, CJ Ramos, was dreaming of speed from the moment he test drove his 2008 Mazdaspeed 3. He was immediately attracted to the car because of its competitive price point and the positive praises it was receiving from the media, but it was way that the car handled and performed during the test drive that sold him on making the purchase. Since then CJ has invested time and money into his Mazdaspeed and it has paid-off. He has won numerous awards for his ride, the most recent being the 2011 NOS Forum Fest – 1st Place Best Mazda 5Door – and aside from being sponsored by CorkSport and Speedware Motorsports, he was also the 2009 Hypertech SEMA booth car and has been voted car of the month and car of the year on the Mazda3forum, where you will regularly catch him doling out great advice and discussing the latest in Mazda performance with other like minded enthusiasts. 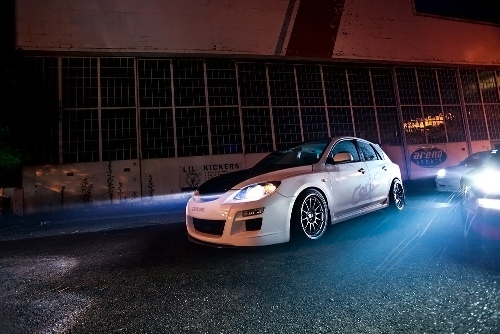 The mods on his Mazdaspeed are numerous. The engine and drivetrain feature a CorkSport turbo-back exhaust, , which includes the CorkSport downpipe, racepipe, and cat-back exhaust. He also added a CorkSport FMIC and stainless brake lines, a CPE motor mount, Devil’s Own Meth Injection Kit, PTP fuel pump internals, Cobb Access Port, Forge bypass valve and TWM short shifter. The mods on the suspension and wheels help to control this powerful car with COBB Front and Rear Sway Bars, KW V2 Coilovers, SPC Rear Camber Kit, GTSpec Bracing, Enkai NT03+m 18×9.5 and Goodyear Eagle GT All-season tires. Not only is this car fast and powerful, but it looks and sounds amazing thanks, in part, to some extensive interior and exterior mods and full sound system that include an Autoexe JDM Front Bumper, Carbon Fiber OEM style hood, angel eye kit, CorkSport skid plate, Sparco R700 Alcantera Seata, Alpine PDX1000.1 1000w Subwoofer Amplifier, Alpine PDX100.4 100wx4 Multichannel Amplifier, and six 6.5” Elemental Designs e3.6 subwoofers. As a new father of baby boy, Avery, CJ joked “I was telling people that if and when I become a father, I wouldn’t have to trade in my car. The trunk can hold all of the stroller and baby gear and the 4 door format can make taking the baby in and out easier than a 2 door coupe.” He said, “But now that I have a kid, the car is filled with show car goodies like my Speedware harness bar and a subwoofer trunk setup.” Fortunately, CJ’s fiancée and best friend, Lanie is caring and totally supportive of his car modding addiction. You can catch CJ and his Mazdaspeed at Import Faceoff and Battle of the Imports this summer or can catch him online on any one of the five forums he frequents, nw-built.com, mazdasnw.com, mazda3forums.com, bcmasdas3.com, or mazdaspeedforums.com. Interested in submitting your car for our new featured car of the month? E-mail Me! 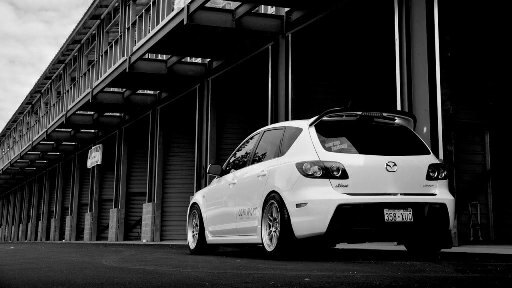 one of the best Speed3s ive seen! Do you happen to know the power it is making with those mods? Pingback: CorkSport Mazda Performance – Blog » CorkSport 2012 Calendar!